Frugal Mom and Wife: Free AppCrayon "Learn To Write Your Letters" App on iTunes! Free AppCrayon "Learn To Write Your Letters" App on iTunes! This is a pretty fun Free app that helps the user learn to write correctly. It has none of those annoying ads either. Your child can use their finger or a regular stylus to write! 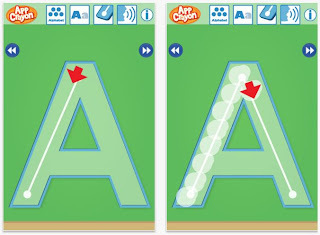 Learn to write your letters with the AppCrayon letter writing system! teachers and pediatricians to help students learn to write their letters properly. and the letter won’t be completed. and can move easily from letter to letter with a simple tap. and use of each letter with the tap of a button throughout the game. and with a greater sense of accomplishment. they’ll see a visual stamp of completion, along with an audio congratulations!